WWE Champion Daniel Bryan might have put himself in hot water ahead of his defence of the WWE Championship at WWE Royal Rumble. UFC Featherweight Champion Henry Cejudo and Nikki Bella might be dating now, and Daniel Bryan is not too pleased about that. He expressed his displeasure recently, and now Henry Cejudo has responded with a warning. Daniel Bryan is the current WWE Champion, who recently turned heel when he turned his backs on fans. This new attitude of Bryan has seen him stand up to face each challenge that has come his way. When he heard about Cejudo wanting to date his sister-In-law, Nikki Bella, he reacted badly saying that Cejudo was not the man that Bryan was. Earlier this week, UFC flyweight champion and AZ resident @HenryCejudo made it known he would like to go on a date with Nikki Bella. Henry Cejudo recently defended his UFC Title against UFC Bantamweight Champion TJ Dillashaw at UFC Fight Night 143. Dillashaw cut a lot of weight to be able to face Cejudo in the Championship fight, but in the end, he lasted only a few seconds before the referee called a stop to the fight, handing Cejudo the win via TKO at 34 seconds. Upon hearing Daniel Bryan's reaction to him wanting to go out for a date with Nikki Bella, Cejudo had a lot to say. He said that there was enough room in the valley for both a king and a prince. He then proceeded to call Daniel Bryan the prince and said that he should know his place and pour the wine. That was not all he had to say as he warned Bryan to not get attached to the WWE Championship, saying that he was on a roll. He was subtly hinting that he might come for Bryan's belt as well. 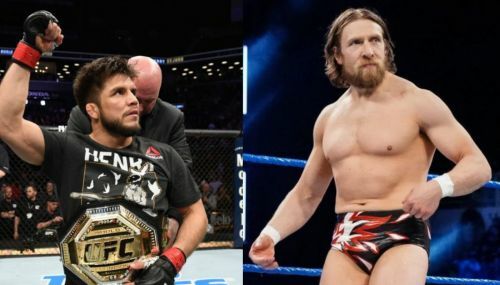 A fight between Bryan and Cejudo would certainly be interesting, but Cejudo is unlikely to want to come to WWE anytime soon. Meanwhile, Daniel Bryan is set to defend his WWE Championship against AJ Styles this Sunday at the WWE Royal Rumble.